A question that has preoccupied women on the other side of the Channel for longer than we can remember: How do French women consistently succeed turning the most banal outfit into something truly orginal and classy? They are not necessarly fashion experts or great designers. They just know how to use the accessories properly. "Easier said than done" I hear you say: not if you couple a bit of French "insouciance" with a few of our ideas to sublimate everyday outfits. A hat has plenty of advantages. It keeps you warm (especially usefull with winter coming), it can hide messy hair you didn't have time to do... And above all, it gives you style. You can choose a classy one, such as Rykiel's round hat. The best is to match its colour with your coat, to create a beautiful harmony. Or you can opt for a wool hat. It's very warm and has a very romantic side. There are many different scarfs, so you will be sure to find the one which matches your style. There are the very thin ones, which should be the same colour of your top to complete it and replace the necklace. There are some scarfs which will cover your all breast and give you a bohemian style. And finally, there are always the big wool scarfs. Choose these very big and long for a maximum effect. Gloves are seeing a comeback and are now so much more than hand-warmers: they are fashion statements in themselves. French Role model number 1: Carla Bruni- choose a classy outfit and small gloves witch match it. Strong effect. If you're more in a bohemian mood, but only have a sad white or black coat, you should pick up some long multicoloured gloves. It will light up your outfit right away. Same thing as for the gloves. 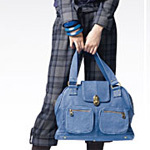 For a classy effect, a bag which matches the colour of your outfit will be the best. But If you feel like shaking it up a bit, multicoloured bags are back, though you should always try to have atleast one colour that refferences an other part of your outfit; be it your coat, shirt or even hat. Belts are a perfect way to show your waist off. Ultra feminine and immediately jazzes up dresses and long pullovers. Thin or large, it's just a matter of figure and taste. Finding some of your tops too banal or lacking in colour? Happily for you, Statement necklaces are back. Colour is every where and the bigger the better- perfect for bringing that little black top a new lease of life. If you're not quite up to the challenge of colour, however, don't panick: metallics are still big, just ensure that the shape is interesting. Alternatively, black ribbon is amongst us again thanks to the gothic trend. Barbara Bui has a stunning velvet flower design, or alternatively, keep it cheap and simple with a small black ribbon tied around your neck for a bit of vampish period chic. Glasses are the perfect way to put some fun in your outfit. Whether you need them or not, go for it- it's the easiest way to add some drama and creativity to any outfit. 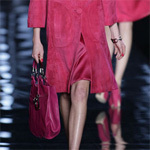 We're loving Rykiel's giant rose tinted ones!